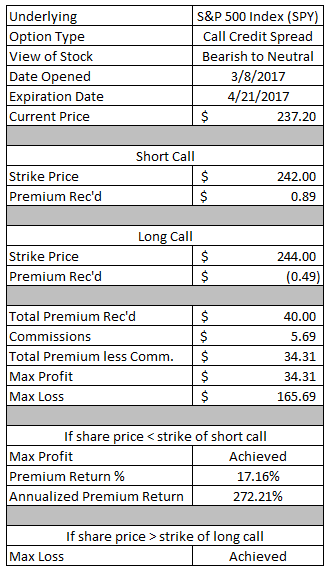 Monday's option recap post covered less than half of the total moves that I made last week. I decided to split it into two posts; one covering the rather straightforward moves and this one that will cover the ones that need a bit more explanation. During late February/early March I decided to start being more active with options in my taxable brokerage account. Of course that increased activity was also involved branching out into the gold miner ETFs. I originally sold this contract in mid-February and as luck would have it the price of GDXJ started falling. Just a few weeks into the trade and my OTM put option was now deep ITM. That meant just waiting things out and seeing if GDXJ's share price rebounds, taking the shares and writing covered calls or rolling the put out in time for a credit. I tried to roll the contract both down in strike and out in time, but I couldn't do so for a credit. However, just moving out in time did let me do so while taking in more option premium. I collected an additional $18.65 after commissions to move the expiration date out to April 7. My original breakeven price was $38.16, but is now lowered to $37.97 which is a 0.50% reduction. Should the price of GDXJ remain below $39 at expiration then I'll have to make the decision to roll the contract again or take the shares. That decision will be determined by how close the share price is to my $39 strike and how much credit I can collect on the roll versus the credit I can get by taking the shares and selling a covered call. If GDXJ's price rebounds above $39 then I'll get to keep the full option premium as profit. That would be a 2.63% return on the cash secured balance or 21.4% annualized. Target's (Stock Analysis) share price sold off hard after releasing earnings a few weeks back declining over 10% in just one day. I thought the selling was overdone a bit, but apparently that was wrong as the share price has declined a bit more and is currently trading just over $55. Since I already have a sizable position in Target in my FI Portfolio I decided to roll this contract out to buy myself more time. I was able to collect $75.91 of additional credits just to move the contract out until the April monthly expiration. I actually collected more on the roll than I originally received when I opened the contract so this was a no-brainer move. My original breakeven price was $56.96 and the additional credits from the roll reduced my breakeven to $56.20. That's an additional 1.3% of downside protection which at the current share price I need as much as I can get. If Target's share price remains below $57.50 at expiration then I'll have to purchase 100 shares at an effective purchase price of $56.20. I'll also look for opportunities to roll this contract out again for additional credits if I don't want to own the shares. If Target's share price rises back above $57.50 then I'll get to keep all of the credits that I've received. The $129.86 of option premium would be a 2.26% return on the $5,750 of capital in play and would be a 17.7% annualized return. Unfortunately the selloff in the gold miners really hurt all of my option positions that I had opened up to generate investment income. As much as I wish I could say this was the last one to report a change, that isn't the case. I originally collect $40 when I opened this contract and was able to get an extra $16.66 on the roll out to the first week of April. That moved my breakeven from $23.10 down to $22.93 which is a 0.7% improvement. If GDX's share price remains below my $23.50 strike, it currently sits at $22.00, then I'll have to make the decision to have the shares put to me or roll the contract once again. If GDX's share price climbs back above the $23.50 strike price then the contract will expire out of the money and I'll get to keep all of the credits as profit. The $56.66 of total credits would represent a 2.41% return on the cash secured $2,350 balance or 25.0% annualized. I really want to build up a long term position in Nike (Stock Analysis); however, the low $50's is a much better value than the high $50's. In hindsight I was too aggressive with this put option when I sold it with Nike's share price trading right around the strike price. Although the way things have worked out thus far I can't really complain. Since I originally sold an ATM put option I collected a much larger credit than the option plays that I typically target. Nike's share price then quickly dropped down most likely because I went more aggressive my put writing. However, I was able to collect $33.91 on the roll and was even able to reduce my strike price by $0.50 to $57.50. My original breakeven was $56.95 and now it's down to $56.11. That's a 1.5% improvement in my breakeven via the additional credit and the strike price reduction. That's pretty big considering all I did was move the expiration date out one week. If Nike's share price stays below my $57.50 strike price then I'll have to decide whether to have the shares put to me at an effective purchase price of $56.11 or roll the contract once again. Since Nike is reporting earnings on March 21st any decision will have to be made after the volatility crush post earnings release. If Nike's share price rises above my $57.50 strike price then I'll get to keep the full option premium as profit. The $138.86 of total credits would be a 2.39% return on the $5,800 of capital securing the original contract. That would be a 48.1% annualized return. Let's go back to the gold miners again. Since the share price was "relatively" close to the strike price I was able to collect a much larger credit than the other GDXJ put that was rolled. I collected an additional $42.66 to buy myself some time for GDXJ's price to recover by moving the expiration date out a couple weeks. My breakeven price was reduced by 1.2% to $35.49. In total I've collected $100.66 in option premium. If GDXJ's share price, currently at $36.15 remains below my $36.50 strike then I'll have to decide whether to roll once again or have the shares put to me. My effective purchase price will be $35.49. If GDXJ's share price climbs back above the $36.50 strike then all of the option premium that I've collected will be profit. The $100.66 works out to a 2.76% return on the $3,650 of capital in play and would be a 24.7% annualized return through expiration. The Fed is poised to raise interest rates this week and I thought that was pretty much completely priced in for many of the bond substitute equities such as REITs. Whether it was fully priced in or having to do with Realty Income announcing a new share issuance, Realty Income's share price has dipped down below my strike price meaning it was decision time. I was able to collect an additional $74.91 to roll this contract out in April expiration which brings my total premium collection up to $134.86. My original breakeven price was $59.40, but it's now down to $58.65 after the roll. If Realty Income's share price remains below $60, currently around $57.50, by April expiration then I'll have to make the decision of whether I want to take the shares or roll the contract out again. As of now I'm leaning more towards rolling it out further in time since my ideal purchase price would be in the low-$50s, but that decision won't be necessary until early/mid April. If Realty Income's share price rebounds back above $60 by expiration then I'll be able to keep the $134.86 of option premium as profit. That would be a 2.25% return on the $6,000 of capital securing the contract or a 17.3% annualized return through expiration. Let's go back to gold one last time, I promise. My original breakeven price on this contract was $23.75; however, I was able to collect an additional $8.66 on the roll to April expiration reducing my breakeven to $23.66. That's a decent 0.4% reduction to my breakeven price. If GDX's price stays below $24.50 by expiration, currently sitting just over $22, I'll have to either purchase shares at an effective purchase price of $23.66 or roll the contract once again. That choice will largely be made based on how my other GDX and GDXJ contracts are sitting at the time. If GDX's share price rallies back above $24.50 then the contract will expire out of the money and I'll get to keep the full option premium as profit. The $83.66 in option premium would be a 3.41% return on the $2,450 of capital that is securing the contract. The annualized return would be 21.5%. I had dabbled with spreads towards the end of last year and was met with mixed success: 1 big win and 1 big loss. However, using spreads is really a numbers game and having just 2 positions under my belt isn't enough to have a firm conclusion of whether I want to continue on or not. A put credit spread is created by selling a put option and then buying another one at a lower strike price. This creates a net credit since you're selling a more expensive contract that is closer to being in the money and buying a cheaper one that is farther out of the money. In general this is a neutral to bullish strategy because ideally you would have the stock price higher than your short put option and thus both would expire out of the money. The maximum profit that I can make on this spread is the credit that I received or $54.91. The maximum risk, or potential loss, is the spread width, $5.00, less the credit received or $445.09. The max profit will be achieved if Digital Realty's share price remains above $100 at expiration. 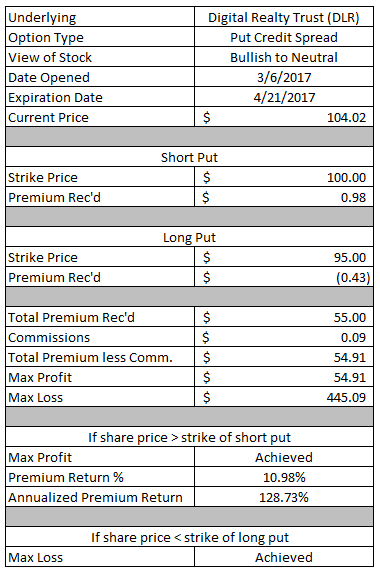 The $54.91 option premium would be a 11.0% return on the $500 of capital in play or a 128.7% annualized return through expiration. The max loss will be achieved if Digital Realty's share price falls all the way below my long strike of $95. Should Digital Realty's share price end below the 2 strikes then the profit/loss will be determined by where the share price is sitting at expiration. Similar to my thoughts regarding Realty Income and REITs, I figured the expected Fed rate hike was priced into the body proxy investments already. Apparently that was wrong as Digital Realty's share price dropped from around $107 when this position was opened to the approximately $104 as of this writing. If I remember correctly the delta of my short $100 put was around 20 when the position was opened meaning there was about an 80% chance that Digital Realty's share price would not be below $100. The call credit spread is essentially the inverse of the put credit spread. It's created by selling a call option and then buying another one that is at a higher strike price and is a risk defined strategy. Call credit spreads are a neutral to bearish strategy. The market's run after the surprise Trump election win and especially since the turn of the year has been amazing. In my view it seems like the market is essentially putting a 100% probability on all of the various tax cuts, deregulation and infrastructure boom all happening which is far from a certainty. So I took a small bet that the S&P 500 had come too far too fast and would either decline or at least not head higher. The maximum profit that I can make on this spread is the credit received or $59.66. The max profit will be achieved if the price of SPY stays below $243 by expiration and would represent a 29.8% return on the $2.00 width of the spread or 262.7% annualized. The maximum risk/loss is the width of the spread less the credit received. For this spread that comes to $140.34 and would happen if the price of SPY continues higher up all the way above the long strike of $245. I set this spread up far out of the money to give myself some wiggle room for SPY to continue a little bit higher. The delta on the short call was about 16 at the time the contract was opened meaning there was about an 84% that SPY wouldn't reach $243 by expiration. Besides my general thoughts on the current market levels/valuations, I'm also set up in quite a bullish manner with the various put contracts that I have open. So I wanted to start adding in some positions that would be profitable should the markets as a whole start moving lower. Once again the maximum profit that I can make is the credit received or $34.31. I'll get to keep the maximum profit if SPY's price remains below $242 by expiration. The $34.31 of option premium would represent a 17.2% return on the $2.00 width of the spread. The maximum loss is the width of the spread less the credit received. For this spread the most I can lose is $165.69 and would happen should SPY's share price rise above the $243 strike of the long call option. Similar to the previous call spread on SPY I set this one up with the short call at about the 1 standard deviation move with a delta at the time the position was opened of about 18. That means there's about an 82% chance that SPY will NOT reach the $242 level by expiration. March is currently well off the pace of January and February, but that largely stems from the fact that the opportunities are harder to come by. 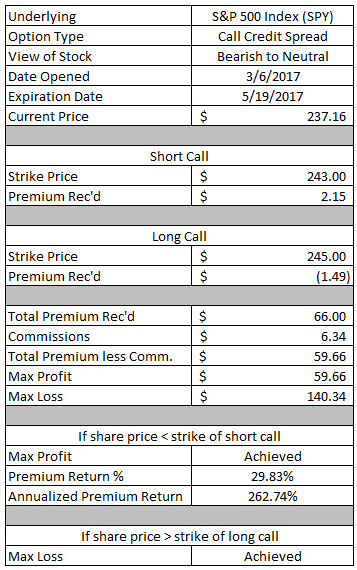 Thus far in March I've generated $497.30 in option profits and booked profits of $3,654.42 through year to date. 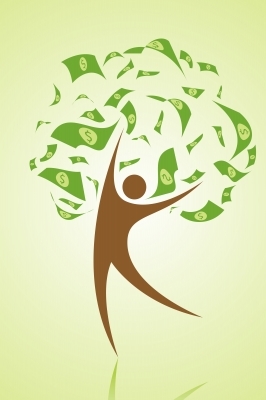 Do you utilize an option strategy to generate investment income in addition to the dividends your positions provide? Do you use spreads to both define your risk and increase your return on capital? Glad I haven't had to be rolling any positions for that long, but I'm sure I'll get hit with it at some point. How far away is your strike on GDX? I'm tempted to let some of these get put to me and then sell aggressive calls. I hate to lock up the capital by having the shares put to me but there's more premium to be had on the calls than the rolls. Although my strikes are relatively close to the current price so it could be a moot point in your situation. Interesting take on TGT, I still don't know what to make of that stock. Yeah TGT has had a pretty epic collapse over the last year or so. Hopefully it'll bounce back a bit because I don't really want to add another 100 shares, but if I do then I'll just start selling calls to collect more premium and have the shares called away. Good luck with the gold miners. You'll need it. Selected quote: "In fact, some of them would be worth more if there were only the actual ore reserves and no corporate apparatus sucking the good stuff out in the name of “value creation”. " I don't have the time or the inclination to research the miners, but I wanted to have some kind of exposure to gold. That led me to the miner ETFs because of the diversification and the high IV which leads to juiced premiums. It should be an interesting ride to say the least.